Any schedule week that has had shifts deleted recently (in the last 45 days) will have a link in the lower right that you can click to view a grid of deleted shifts. On that Recently Deleted Shifts grid you can sort, select shifts and then restore them or export to clipboard (for use in other programs). You also can see who deleted the shift (click name to message them) and when then deleted it (click to see Shift History). 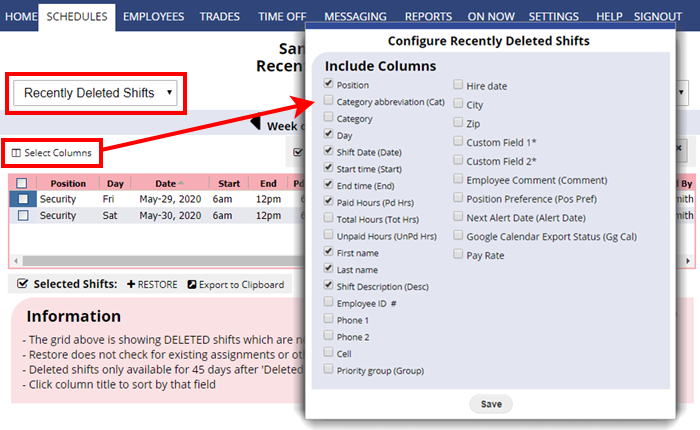 Managers with permission to add/delete shifts can select shifts and click to Restore them. When deleted shifts are restored W2W does not check for conflicts so you may want to then use the Analyze feature. On published weeks you will see the option to “Send notification for each change” – check that box before restoring the shift and the affected employees will be notified about their new shift assignment. You can sort by any column and use the “Change Layout” to include various columns in the view.